Coatings « Global Market Insights, Inc. The global epoxidized soybean oil (ESBO) market, in the years to come, is estimated to register significant growth prospects, attributed to the product’s vast end user landscape. Epoxidized soybean oil is commonly used as a plasticizer and heat stabilizer in several food contact materials, particularly in vinyl chloride or PVC films and gaskets. Currently, the product’s immense popularity can be primarily credited to the enforcement of stringent regulations against the use of phthalate stabilizers. Speaking of which, phthalates are a group of synthetic chemicals that are extensively used in several consumer products that include medical devices, building materials, packaging and children’s toys and childcare products made from polyvinyl chloride (PVC). Lately, the chemical has been identified as a developmental and reproductive toxicant. Moreover, the US EPA classified DEHP and BBP as possible human carcinogens respectively. Epoxidized soya bean oil serves as the perfect alternative against phthalates in order to build plasticizers and heat stabilizers, thereby propelling ESBO market size. The rapid emergence of biocompatible lubricants due to stringent regulations applicable to mineral-oil-based lubricants and their non-biodegradable toxic wastes may also impact the epoxidized soybean market positively. Before hitting the market, vegetable lubricants made from vegetable oil are required to overcome some poor performance characteristics like thermal and oxidative instabilities. This helps demonstrate the improved performance of epoxidized soybean oil in certain high-temperature lubricant applications. The problems associated with vegetable oils like poor oxidization and low-temperature properties can be enhanced by attributing functional groups at the sites of unsaturation occurred due to chemical modifications. In several countries, about 40 percent of a lubricant can be lost to the environment and with rising petrol prices, development of new industrial products from soybean seem economically feasible. Although soybean oil shows superior lubricity, vegetable-oil-based lubricants possess a weaker oxidative stability and flow under low temperatures but by attaching some functional groups at the site of unsaturation these problems can be resolved. The fact that vegetable-oil properties can be improved for lubrication through functionalization methods will drive the epoxidized soybean oil market in the years to come, as they are deployed as industrial lubricants. 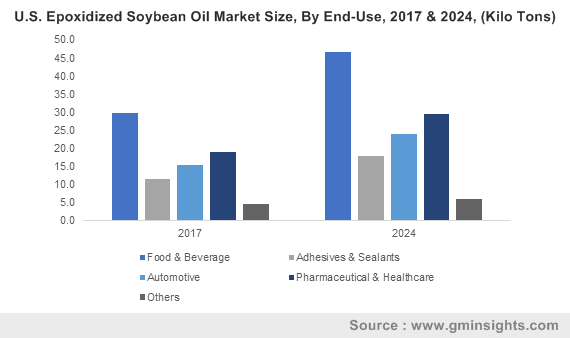 The epoxidized soybean oil market may witness significant growth in Europe, driven by highly developed countries such as France and Germany, that boast of an expanding regional food and beverage industry. Incidentally, in 2017 the Committee for Social-Economic Analysis backed a proposal by the European Chemicals Agency and Denmark to limit the use of four phthalates namely BBP, DEHP, DBP and DIBP in articles comprising plasticized materials. In 2018, The European Environmental Bureau and CHEM Trust sent a letter to EU Member State representatives on the REACH Committee bringing to attention that the restriction excludes the use of phthalates in food contact materials even though maximum exposure to DEHP comes from food. 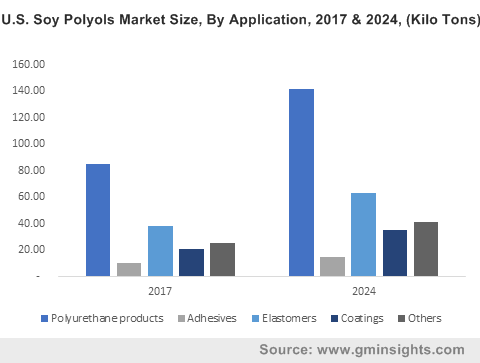 The restriction of phthalates from FCMs is likely to encourage the use of epoxidized soybean oils for creating gaskets of glass jars and on food and beverage can coatings, that would eventually augment the epoxidized soybean oil market. The transesterification of epoxidized soybean oil often helps in preparing epoxidized methyl esters Transesterification is achieved within 10 minutes at 50 degree Celsius without losing epoxide function. Epoxidized methyl esters characterize a renewable substrate that is readily turned into fuels, surfactants, additives and other industrial products. Therefore, the transesterification process can increase the availability of epoxidized methyl esters and endorse the development of new bio-based products, impelling the growth of epoxidized soybean oil industry. The epoxidized soybean oil market is indeed slated to record commendable gains attributed to the product usage as a raw material for various applications including polyol replacements, functional fluids, fuel additives, and agricultural and pharmaceutical molecules. Owing to its high molecular weight, the product can resist volatilization, extraction, and migration and act as a polymeric plasticizer. Driven by its widespread demand credited to its highly beneficial characteristics, the global epoxidized soybean market is anticipated to exceed $650 million by the year 2024. This entry was posted in Bulk & Specialty Chemicals and tagged Acetic Acid, Adhesives & Sealants, Agricultural Chemicals, Automotive, Coatings, Cutting Oils, Epoxidized Soy Oil Market, Epoxidized Soybean Oil Market, Epoxidized Soybean Oil Market Size, Flavor & Fragrances, Food & Beverage, Formic Acid, Fuel Additive, Functional Fluids, Global Epoxidized Soybean Oil Market, hydrogen peroxide, Lubricants, Pharmaceutical & Healthcare, Pigment Dispersion Agent, Plasticizers, Soybean Oil, Surfactants, UV Cure. 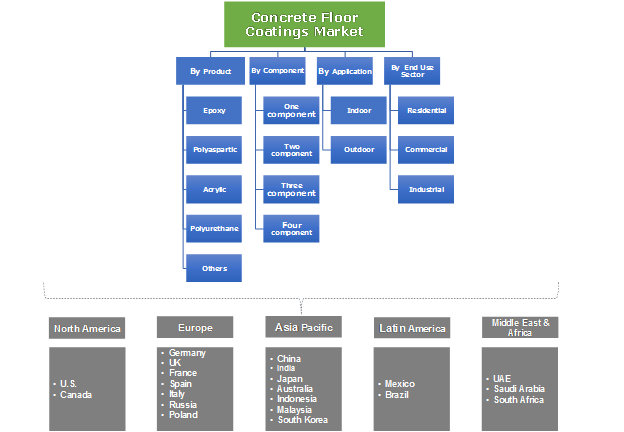 Global Concrete Floor Coatings Market is poised to witness a major upswing with the soaring construction industry worldwide. On the global level, the total construction spending crossed a mark of USD 7 trillion and is foreseen to record USD 13 trillion by 2024. Flooring is an integral part of the construction industry, and finds wide application in the residential and commercial sectors. Concrete floor coatings are majorly used in flooring applications to provide resistance against harsh climatic conditions and abrasion. The overall construction industry in the BRICS nations has been depicting promising growth prospects and is expected to grow at an annual rate of 11% over 2016-2024. The growth of concrete floor coatings market is dependent on two factors – the massive growth in the construction industry and the simultaneous expansion of the flooring industry. Escalating renovation and new infrastructural projects are expected to enlarge the scope of the business. As per a report by Global Market Insights, Inc., Concrete floor coatings market is projected to record a 7% CAGR over 2016-2024 and exceed a market valuation of USD 1.5 billion by 2024. The flourishing construction business across Asia Pacific has been a crucial factor driving the regional concrete floor coatings industry share. The emerging economies of the region, including India and China are experiencing robust growth potential in infrastructural development and manufacturing facilities, which has heightened the product demand in the region. Moreover, rising population and changing consumer lifestyle have also positively led to the massive development of the regional market. Asia Pacific concrete floor coatings industry is anticipated to attain a CAGR of 8% over the period of 2016-2024. China, in 2015, accounted for more than half of the total construction industry revenue generated by BRICS nations, and is expected to observe the highest growth in concrete flooring market over the coming years. Post 2008 economic turmoil, North America has experienced a surge in the construction sector and has a strong pipeline of numerous construction projects. Strong growth in the pharmaceutical, automotive, and food & beverage industry has stimulated the product demand for flooring applications across the region. A significant rise has been observed in remodeling and renovation projects across the residential sector, which has driven the concrete floor coatings market size. Accounting for more than 30% of the overall industry share, North America led the worldwide concrete floor coatings industry share in 2015. Concrete floor coatings also find significant applications in indoor and outdoor sectors. Concrete floor coatings market revenue from outdoor applications is anticipated to grow at a CAGR of over 6.5% during the duration from 2016 to 2024. High government funding for infrastructural growth has impelled the product usage in outdoor applications such as driveways, pathways, garages, and walkways. Indoor applications, which dominated the application landscape in 2015, are expected to contribute notably towards concrete floor coatings market share over the years ahead. The growth can be attributed to the high product preference across residential and commercial constructions. The growing need for improving sports infrastructure will further drive the product demand. Polyurethane, epoxy, and polyaspartics are the major concrete floor coatings products. Thriving polyurethane sector, which is projected to surpass a revenue of USD 75 billion by 2023, will boost concrete floor coatings industry trends. Development of bio-based polyurethanes for various coating applications will further push the industry revenue. Epoxy concrete floor coatings market value, which was estimated at over USD 400 million 2015, is expected to grow remarkably over the years ahead. Prominent product applications in the railways, hospitals, airways, schools & colleges, pharmaceuticals, and electrical & electronic sectors are expected to favorably influence its demand. Flourishing epoxy surface coatings sector will further boost the industry revenue. Polyaspartics concrete floor coatings industry is forecast to register a CAGR of over 7% over 2016 to 2024, driven by the mounting product use in outdoor applications as a result of its exceptional UV radiation resisting characteristics. Henkel AG & Company KGaA, BASF SE, Sika AG, RPM International Incorporation, Epmar Corporation, PPG Industries Incorporation, Koninklijke DSM N.V., Rodda Paint Company, Vanguard Concrete Coating Incorporation, Nippon Paint Holdings Company Limited, and The Sherwin-Williams Company are the major participants of concrete floor coatings industry. This entry was posted in Polymers and Advanced Materials and tagged Coatings, Concrete Floor, Concrete Floor Coatings, Concrete Floor Coatings Market, Concrete Floor Coatings Market Analysis, Concrete Floor Coatings Market Future, Concrete Floor Coatings Market Growth, Concrete Floor Coatings Market Outlook, Concrete Floor Coatings Market PDF, Concrete Floor Coatings Market Price, Concrete Floor Coatings Market Report, Concrete Floor Coatings Market Share, Concrete Floor Coatings Market Size, Concrete Floor Coatings Market Trends, Concrete Floor Coatings Market Update.